With a goal of enhancing the business of health care in northwest Ohio and beyond, The University of Toledo has established the School of Healthcare Business Innovation and Excellence. The UT College of Business and Innovation and the College of Medicine and Life Sciences have taken a leadership role in establishing the new school. “Utilizing interdisciplinary expertise from a variety of business fields, including finance, management, information technology, operations management, process improvement, marketing and more, the faculty of the UT College of Business are ready to help you and your medical team enhance your operations and achieve your business goals,” explained Dr. Thomas Sharkey, interim dean of the College of Business and Innovation. “Through research, community engagement and educational endeavors, this school serves as a premier resource for directly impacting quality health-care delivery,” he added. Dr. Jeffrey P. Gold, dean of the College of Medicine and Life Sciences, said the college’s participation in establishing and supporting the School of Healthcare Business Innovation and Excellence is a natural extension of its longstanding mission. As the school expands, other UT colleges and programs may become involved; these may include the College of Business and Innovation’s Executive Center for Global Competitiveness, UT Medical Center, Judith Herb College of Education and Health Science and Human Service, and the colleges of Engineering, Law, Nursing, and Pharmacy and Pharmaceutical Sciences. “Establishing the School of Healthcare Business Innovation and Excellence is a timely and relevant step for The University of Toledo,” noted UT President Lloyd Jacobs. “The health-care arena is experiencing tremendous change on many fronts, and it is appropriate that UT brings its information and expertise into the community to benefit all involved. Collaborative efforts with health-care providers, business leaders, government policymakers and others will produce breakthrough enhancements that increase efficiencies, reduce costs and, ultimately, provide better, more patient-centered care. 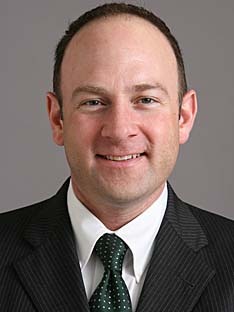 “Furthermore, the school will partner with businesses and organizations beyond the University, such as health-care providers, labor unions, governments, business and economic development agencies, and insurance providers, which will provide direction for educational, research and outreach programs,” Jacobs added. A variety of undergraduate, graduate and certificate programs focused on skill development at the intersection of health care and business are available through the school. Contact Dobrzykowski at 419.530.2342. This entry was posted on Friday, October 26th, 2012 at 4:33 am and is filed under Business and Innovation, Medicine and Life Sciences, News, UToday .